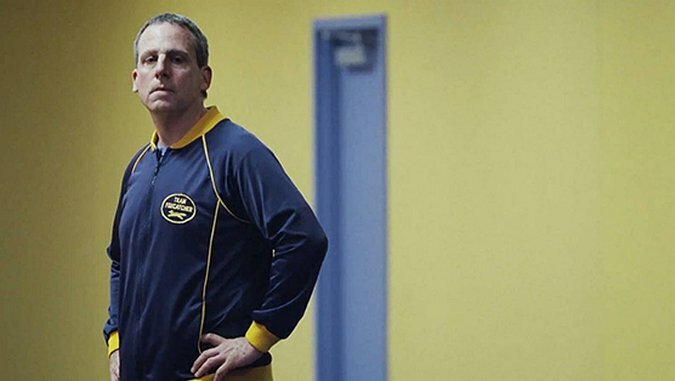 Foxcatcher has been getting a lot of attention, not to mention Oscar speculation, for star Steve Carrell embracing a seriously dark, dramatic role. Not that comedic actors taking on this type of material is without precedent; Robin Williams, Tom Hanks, Bill Murray and Jim Carrey are just some of the funny folks who have moved to darker material in the latter half of their careers. Given the old adage about comedy being tragedy plus time, it’s no wonder that comic actors can thrive in a solemn filmic atmosphere. Carrell takes this solemnity one step further in director Bennett Miller’s (Capote, Moneyball) new film, going full De Niro with a physical transformation that renders him not unrecognizable, but, distractingly, too recognizable. Carrell’s presence isn’t transformed, just covered up, like a huge blemish doused in makeup but even more obvious in the right light because of the makeup. One can’t help but gaze at his prosthetic nose, liver-spotted skin, receding hairline and paunch, and see a crutch rather than an essential means to enrich his role. This role is creepy rich guy John du Pont, the heir to a massive fortune who seems to believe that he’s destined for greatness. Carrell’s halting, unsettling speech is jarring at first, reading a bit too much like unnecessary affectation; underneath his cold upper crust accent occasionally surfaces the funny Carrell playing with the weirdness of the character. These are the moments where he’s at his best and most natural, proof that he would probably be able to carry this role without all these actorly accoutrements. Foxcatcher, based on events that occurred in the late ‘80s, follows Olympic wrestling champion brothers Mark (Channing Tatum) and David Schultz (Mark Ruffalo) as they bide their time until their next competition. Older sibling David is a stable family man and Ruffalo plays him with an endearing, quiet affection towards his younger brother. Mark, on the other hand, wallows depressively through his day to day, picking up $20 here or a brand new neurosis there for speaking at elementary schools and sitting in his run-down apartment by himself—respectively. Tatum is earnest and self-serious, a gorilla jaw only coming alive when he spars with his brother at the gym. In contrast with Carrell, Tatum and Ruffalo embody their roles with raw but subtle emotion. Their wrestling scenes are silent and aggressive, the thudding of bodies and the brothers’ soft grunts the only soundtrack. Their training starts out intimately: they massage each other during warm-ups, physically close in ways most sports movies avoid, but it’s not long before the anger and violence bubbling just underneath the surface, at least on Mark’s side, erupts. A nose is bloodied; pride severely bruised. It’s both an ominous portending of things to come and a total upending of the brotherly closeness demonstrated just scenes before. Enter John du Pont, who flies Mark to his estate via private helicopter and then offers him a salary, a chalet to inhabit with a fully stocked fridge and the chance to bask in his glory as the new benefactor and coach of the U.S. wrestling team. Later, du Pont offers Mark as much alcohol and cocaine as he could possibly want—and thus their relationship proceeds, an unsettling thing to watch unfold. Du Pont clearly wants something more from Mark, but can’t quite express what it is, even though Mark seems willing to give him whatever he needs. This underlying sexual tension finds juxtaposition with Mark’s relationship with his brother. Du Pont is clearly titillated as he pathetically tries out various holds and positions on Mark, and Carrell refrains from overplaying and making his excitement too obvious. Miller allows this tension to build throughout the film, culminating in a scene after a wrestling victory where John drunkenly piles on each member of the wrestling team. The athletes tolerate it—with building discomfort—and du Pont sinks further into delusion. If on the surface this is a story about men seeking intimacy through unadulterated physicality, at its core, Foxcatcher is about people searching for something missing from their lives. Du Pont is terrorized by his placid, elderly mother (Vanessa Redgrave, in a small cameo), the severe matriarch of his wealthy family who does not approve of his wrestling ambitions. Mark is searching for a father figure, someone to lead him out from the shadow of his older brother. Of course (spoiler alert for those not familiar with the true-life story), all this leads to a final, definitive, deadly confrontation. The film doesn’t go out of its way to explain why this tragedy occurs, instead allowing the performance of the actors to provide all the clues that are needed. The conclusion is practically a given, but this is hardly the point. Despite reveling in Carrell’s Oscar hype, Foxcatcher doesn’t seem interested in the confrontation itself, or the weirdness of the men at that point, but the loneliness and the primal forces that made sure they’d get there, in the end, no matter what.